The Personal Property Security Act 2009 (Cth) (the PPSA) governs the validity, enforceability and priority of security interests in personal property. The PPSA commenced on 30 January 2012. The first challenge may be educating your clients about the importance of the new law. Clients are often confused by the term ‘personal’ and assume that it relates to consumer and not business transactions. be recovered by a real action for repossession. Personal property at common law embraces all forms of property other than interests in land such as chattels, choses in action and wills. (ii) declared by that law not to be personal property for the purposes of the PPSA. The PPSA provides examples of personal property security interests including: Fixed charges, floating charges, chattel mortgages, conditional sale agreements, hire purchase agreements, pledges, trust receipts and leases of goods . The PPSA also lists a variety of interests that are not security interests subject to the new law including fixtures upon land, interests claimed by pawnbrokers and liens . A Purchase Money Security Interest (PMSI) is a new security interest created by the PPSA that gives the secured party a ‘super-priority’ over other creditors. It is a security interest taken in collateral to the extent it secures all or part of the purchase price of the collateral . • ASIC register of company charges. The consolidation of the various registers involved the migration of data into the PPSR. One of the major hiccups was the failure to migrate some registrations such as company charges (1.5 million were transferred) and as some company charges were not effectively migrated some secured parties may need to re-register on the PPSR. contradicts this proposition and the PPSR provides a mechanism for prioritising competing security interests in personal property by registration. The most important change, however, is that a registered security interest on the Register will have priority over the unregistered interest even if the unregistered was first in time . Finally, because the PPSR is a public register it will change business processes and it will become a standard search conducted in a variety of business and consumer transactions. It may also increase the transparency of business transactions by providing a noticeboard of security interests registered against a business entity or natural person. The PPSR website is straightforward to use and will be accessible to any user. It can be used by either a casual user (credit card) or you can apply for a 30 day account (payment terms). PPSR searches and registrations are conducted on the same website and clients will be able to do their own registrations or instruct agents to register a security interest on their behalf. The PPSR website is operated by the Insolvency Trustees Services of Australia (ITSA) and ITSA has a call centre taking calls to assist users. Many businesses have engaged agents to conduct ‘mass uploads’ rather than enter information on the website directly. These agents aggregate data on security interests and upload this information to the PPSR. disclosed to the redundant register (such as the ASIC register of company charges). The 6 Section 55(3) PPSA rationale for the level of disclosure to the PPSR has been described as the “noticeboard” approach. (e) Duration of the registration . 5. PPSR: What is the registration process? (c) In addition to a verification statement, a token is sent to the secured party. From the moment an interest is registered it is recorded on the Register and this means that the registration time of a security interest is precise to the second. secured creditors losing their rights to collateral because of the urgency of selling equipment . One approach may be for a law firm to create a generic email for the PPSR, i.e. ppsr@sklawyers.com.au. There is also a requirement for the secured party to provide notice of the verification statement to the grantor unless that requirement has been waived in the security agreement or the property may be classified as commercial property . (d) Intangible property such as a patent. The PPSR has a low cost of registration because the pricing of registrations is on a costbasis to encourage use of the register. It is $3.70 to conduct a PPSR search and $7.40 for a seven year registration. Firstly, the definition of a security interest is a now a functional definition that will expand the existing categories of personal property security interests. Secondly, title is ‘no longer king’ because security interests are perfected by registration and therefore unregistered interests, such as retention of title claims will be second in priority to registered security interests. Finally, the fact that the PPSR is a public register will change business processes because credit providers will check the register and the increased transparency may reduce false wealth in the economy. When checking the PPSR you must use precise spelling and reference details. In other words, there is no ‘wildcard’ search that you might find in other web search engines. You can conduct a PPSR search by grantor, serial number, unique financing statement reference or point-in-time reference (through the ITSA call centre). As such multiple searches may be necessary to ensure your search doesn’t miss any grantor details. If it is a company you should search by ACN and ABN and if it is a natural person you should search by full name and any abbreviated names, e.g. Ben Sewell and Benjamin Sewell. the search doesn’t fit a category listed in the PPSA. 4. A security interest bestows some form of proprietary right. A security interest for the purposes of the PPSA is “an interest in personal property provided by a transaction, that in substance, secures payment or performance of an obligation (without regard to the form of the transaction or the identity of the person who has title to the property)” . Importantly, this does not define a ‘security interest’ as an interest in personal property presently recognised by the law. The categories of security interests in personal property are opened up by the PPSA and therefore the test of a security interest is functional and it has been described as an “in substance” test. The PPSR does not require disclosure of all information regarding the security interest or collateral that is registered on the PPSR. The strategy in the PPSR was to create a noticeboard on the internet portal. (e) No copy of a contract or details of net indebtedness. The information on the PPSR, if used for due diligence in a business transaction, may produce multiple registrations that will need to be interpreted with business acumen. Clients need to be aware that there are registration requirements for retention of title (ROT) claims. Registration of ROT is essential or commercial products supplied on credit will vest in an administrator or liquidator in an insolvency scenario . When dealing with ‘$2 companies’ it is now standard practice to require director’s guarantees in contracts such as a credit application. With respect to debt collection, personal guarantees may be secured against directors’ personal property and this may be extended through strategic registrations on the PPSR. You may advise your clients to include representation and warranty provisions in contracts where financing statement information is required to provide some protection in the event the wrong serial number is registered. It may also provide a claim for damages in the event of misleading or inaccurate financing statement information being received. (a) What is the current business process and how is it documented? (b) In what way will PPSR change the business practice? (c) What gaps exist between what is currently being done and what needs to be done? (d) What document changes are needed? (e) What process changes are needed? Under the old regime the financing of business was principally by way of fixed and floating charge. The ‘General Security Agreement’ is the new financing instrument for banks because the fixed and floating charge terminology was made redundant by the PPSA. A charge may also be taken over specific assets and this is now called a specific security agreement. 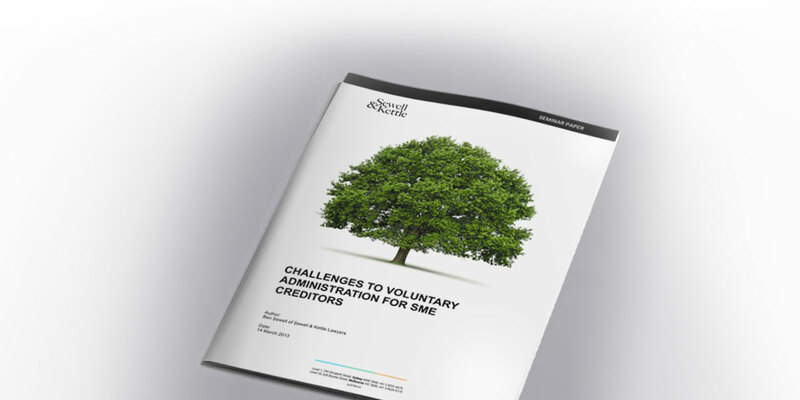 Banks are likely going to require SMEs to execute further updated documents in the short term and therefore this is an opportunity for lawyers to advise clients on changes to the law and documentation. Financiers are taking an interest in searches and registering PMSIs over inventory in order to trump other creditors. The PPSR has also changed the process of selling a business because PMSIs will need to be examined by a purchaser’s solicitor. PPSR searches will also give suppliers the opportunity to evaluate the asset position and debt level of a customer with other suppliers. (a) Is there a personal property item that may not subject to a registered security interest? (b) Can a contract be formed with the grantor to secure the property (i.e. attachment)? arrangements may be used to pay liquidator’s fees or priority creditor claims. Under the previous regime, the value would be paid to your client or the goods would be returned without the need to demonstrate a registered interest. The ideal security under the PPSA to protect an ROT claim is a PMSI as it gives a creditor ‘super-priority’ over other creditors. A valid PMSI means your client will have ‘super-priority’ being an interest in collateral ahead of other secured creditors (i.e. banks and other priority creditors). This will extend to book debts and proceeds arising out of sale of collateral. However, be warned that if you ‘tick’ the PMSI box during the registration process and you do not have an agreement to grant a PMSI, you will lose your security . The exception is in the case of fresh receivables finance after the PMSI and it has a priority to perfected PMSIs. The PPSR provides a noticeboard of interests but your clients may be interested in more detailed information. The PPSR ‘noticeboard’ will only give your clients limited information when conducting searches. An “interested person”, however, may request further information from a secured party. Such information may be a copy of the security agreement and details of the debt owed by the grantor. This obligation to provide information to an interested party that may make such a request can be waived by a confidentiality agreement (i.e. term) between a grantor and a secured party. An “interested person” (for the purposes of requesting further information about a registered security interest) is defined under section 275 of the PPSA as a person with another security interest in the collateral. This limits the right to require information to a scenario where there are multiple claims to collateral. If you are drafting a contract that provides for personal property security interest you may include a confidentiality clause pursuant to this section to avoid this requirement. A transitional interest is a security interest created before 30 January 2012 or out of an agreement dating to before 30 January 2012. Generally, transitional interests will be taken to be perfected for a period of 24 months from 30 January 2012 and this represents temporary perfection. To register inventory it must be before the grantor obtains possession for tangible property or before attachment for intangible property. For non-inventory is must be registered within 15 days of the grantor obtaining possession or attachment. Key timeframe 3: What constitutes a PPS lease? A PPS Lease means a lease or bailment of goods. However, a PPS Lease does not include a lease by a lessor who is not regularly engaged in the business of leasing goods . A PPS Lease will have a term of greater than one year or it will be goods described by serial number with a term of greater than 90 days.